The Vichy Shower is an experience special to SPA 211. Our Vichy Shower has eight adjustable shower jets to caress your body under an invigorating waterfall. 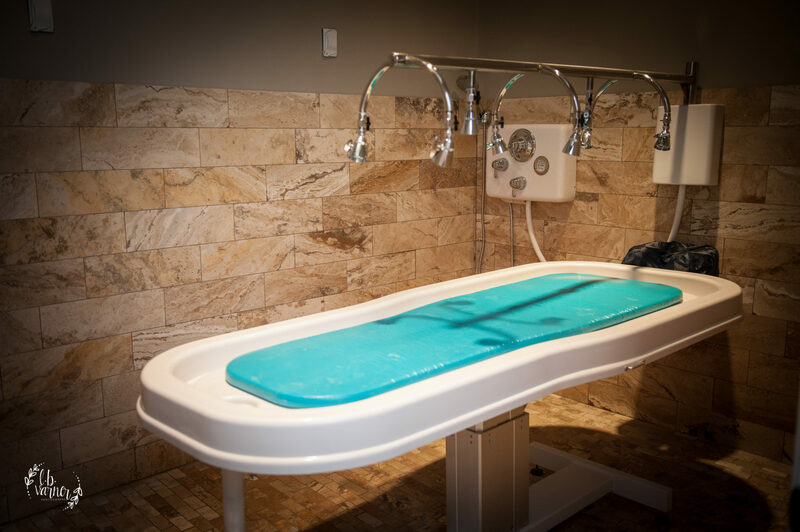 The therapist adjusts the pattern, placement and temperature of the jets to achieve a whole-body water massage treatment. When all 8 jets are on, approx 75 litres of water a minute flow over your body, producing in many people a sensation of floating on water. The effect of so much water movement on your skin is to increase the blood circulation, hydrate the skin and sooth the nervous system, enabling your body to balance and your muscles to relax. Breathe in the aromatic fragrance of the French countryside as you surround the skin in a richly hydrating cocoon. Start with an invigorating sugar scrub followed by a wrap in this remarkable mud contains soothing Rose Clay extracted from the Provençe region of France. The treatment is finished with an invigorating rain shower and moisture rich body butter. Rose Body Mud is the ultimate for refining and extreme hydration, perfectly suited for dry, delicate, weathered or aged skin. How better to combat the drying of winter and feel smooth, silky and radiant than with an invigorating & exfoliating sea salt or sugar scrub followed by hydrating moisture rich and uplifting body butter to leave your skin soft, hydrated and refreshed. Essential oils and sugar or sea salt custom blended to your desire. Rich in minerals and trace elements this all natural treatment is used for detoxifying and remineralizing the body. You begin with dry exfoliation, then hot mud compresses along with a scalp & neck massage. The treatment is finished with an invigorating rain shower delivered by our eight shower head Vichy and moisture rich body butter. Breathe deep and lay back as warm mists and cleansing aroma-therapy vapors relax muscles and purify the body all while our therapist kneads the muscles of your face, scalp, neck and shoulders while streams of rain and steam relax the mind. For the hard to reach back area an exfoliating, deep cleansing followed by a rejuvenating Vichy Shower. The back-cial will remove remove impurities and restore the skin with healing nutrients. Usually associated with a luscious dessert, this SPA 211 dessert will treat clients to a full body airbrush tan that assures a summer time glow without the risk of aging. Add a sugar scrub done in our Vichy shower for a full body exfoliation prior to your spray tan.